Personalizable Stunning 60th DIAMOND Party Theme Ideas. I can change anniversary to ANY OCCASION with Your TEXT, Your COLORS and PHOTOS. 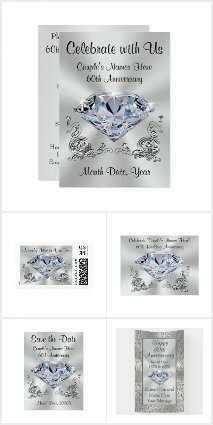 See short video featuring Beautiful diamond party decorations, diamond invitations for birthday, anniversaries and weddings. Type in Your NAME, Add Your PHOTO. Free custom designing service by Little Linda Pinda Designs on Zazzle 60th Anniversary Party Supplies and Gifts. A+ Better Business Bureau Rated personalizable gifts company. Personalized 60th Wedding Anniversary Banner in Various Sizes Customized for You! You, or I, Zazzle Designer Little Linda Pinda, can change the Text and Background COLORS to any colors. I can create matching personalized anniversary party supplies and gifts if you’d like too. Little Linda Pinda Designs offers FREE Custom Designing Service on Hundreds of Zazzle Custom Anniversary Party Supplies and Gifts. I can create matching anniversary party supplies for ANY YEAR, ANY COLOR or ANY OCCASION. I can change the Diamond Themed Anniversary Party Supplies to different symbols or gemstones in many colors for any year anniversary party. Every part of any of my designs COLORS can be changed, as available. I can change the Diamond colors too. DIAMOND Party Theme Ideas are designed by Little Linda Pinda Designs.